^ In the context of Commodore Perry's "opening" of Japan in 1853, American naval expedition planners did have the reasonable forethought to incorporate reference material written by men whose published accounts of Japan were based on first-hand experience. J.W. Spaulding brought with him books by Japanologists Engelbert Kaempfer, Carl Peter Thunberg, and Isaac Titsingh. Screech, T. (2006). 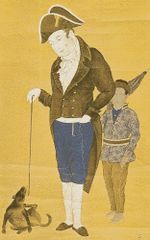 Secret Memoirs of the Shoguns: Isaac Titsingh and Japan, 1779-1822, p.73.